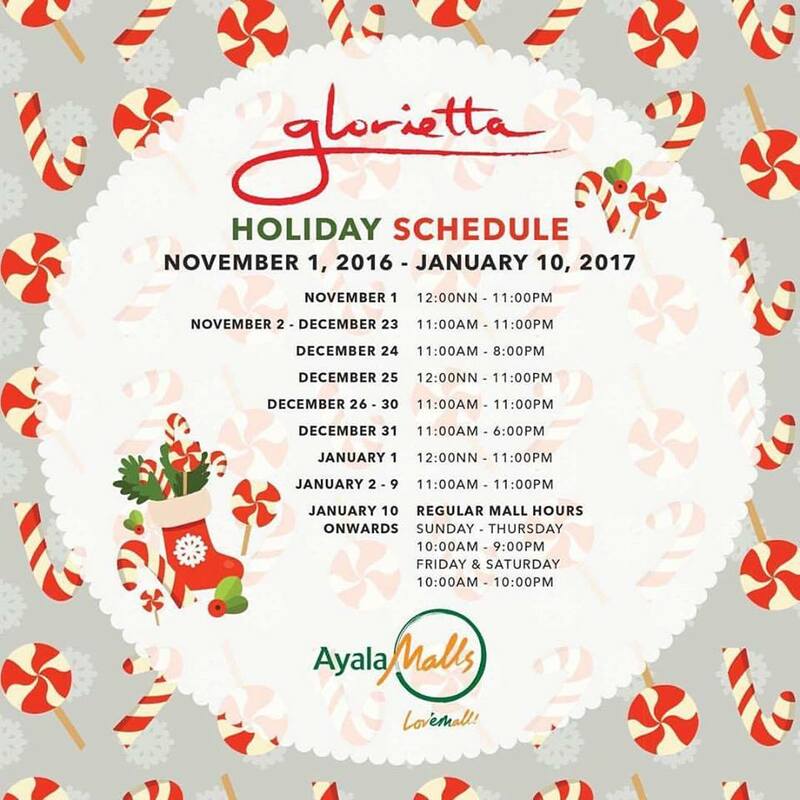 MANILA, Philippines - Several mall operators have released mall hours schedule for Christmas Holidays (December 2016) and on New Year 2017 (January 1). 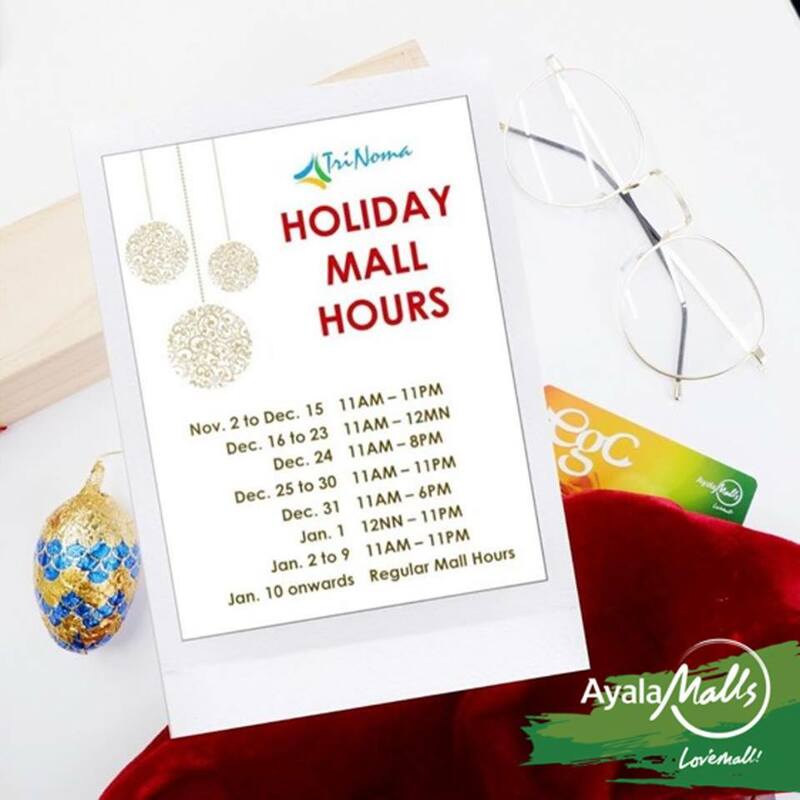 Check out the list of shopping malls that are open these holidays: SM Supermalls, Ayala Malls (Greenbelt, Glorietta, Bonifacio High Street), Ever Gotesco Malls, Powerplant, Market! Market!, Greenhills Shopping Center, Robinsons Mall, Eastwood and other malls in the country. Filipinos are expected to flock malls to celebrate the season with family and friends - buy gifts, shop or watch their favorite Metro Manila Film Festival (MMFF) 2016 entries. Dominant mall operator SM Supermalls announced schedule per branch through their Facebook page. Majority of the shopping malls will open at 9:00 am on December 24 and 31 and will cut short its operation for Christmas and New Year celebrations. The Summit Express gathers the schedule of the major malls in Metro Manila and nearby provinces to serve as guide for those who will go on a shopping rush and other activities for Christmas season. 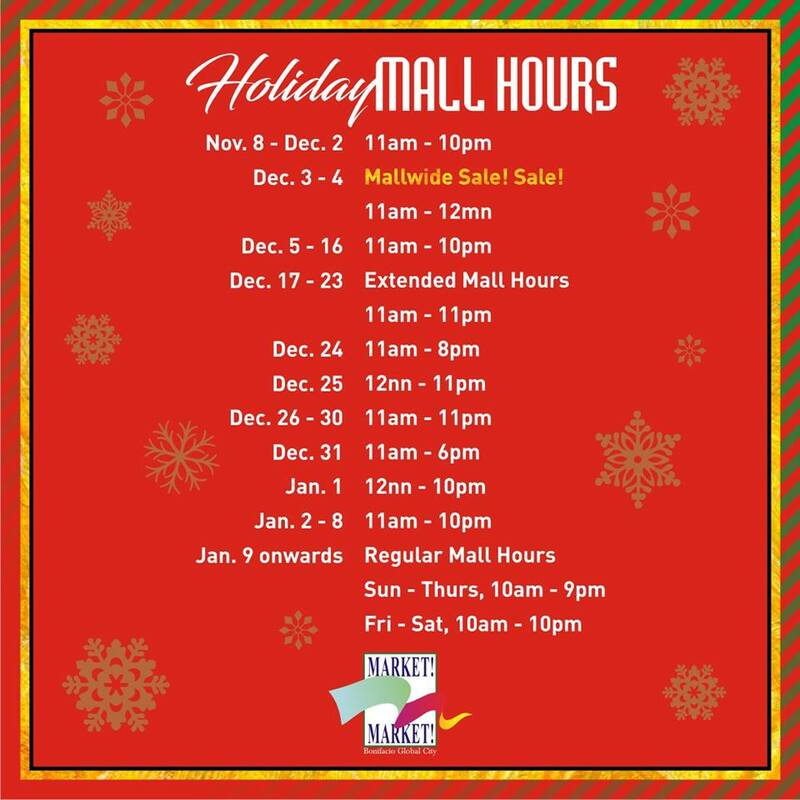 SM Supermalls - Check out the nationwide list of SM mall schedule (NATIONWIDE LIST: SM Mall Hours Schedule Christmas Holidays 2016, New Year). December 24: 10 a.m. to 8 p.m.
January 1: 12 nn to 9 p.m.
December 19 to 23: 10 a.m. to 11 p.m.
December 24: 10 a.m. to 7 p.m.
December 19 to 23: 11 a.m. to 12 m.n. December 25: 12 nn to 10 p.m.
January 1: 12 nn to 10 p.m.
December 27-30: 10:00 a.m. to 9:00 p.m.
December 31: 9:30 a.m. to 8:00 p.m.
Sun 10:00 a.m. -10:00 p.m.
Mon-Thu 11:00 a.m. – 10:00 p.m.
Fri-Sat 11:00 a.m.- 11:00 p.m.
Sun – Thurs 12 p.m. – 11 p.m.
Mon - Thu: 11:00 a.m. - 10:00 p.m.
December 19 to 23: 10 a.m. to 8:30 p.m.
December 26 - 30: 9:30 a.m. to 8:30 p.m.
December 31: 9:30 a.m. to 7 p.m.
December 19 to 23: 10 a.m. to 9 p.m.
December 24: 9 a.m. to 9 p.m.
December 26 to 30: 10 a.m. to 9 p.m.
December 31: 9:30 a.m. to 8:30 p.m.
January 1: 12:00 nn to 9:00 p.m.
December 19-23: 11 a.m. to 11 p.m.
December 25: 12 nn to 11 p.m.
December 26-30: 11 am to 11 p.m.
January 1: 12 nn to 11 p.m.
January 2-9: 11 a.m. to 11 p.m.
December 19-22: 10 a.m. to 9 p.m.
December 25 to 29: 10 am to 8 p.m.
December 30: 10 am to 9 p.m.
January 1: 10 am to 8 p.m.
December 19-22: 11 a.m. to 10 p.m.
December 23: 10 a.m. to 12 m.n. December 25 to 29: 11 am to 9 p.m.
December 30: 11 am to 10 p.m.
January 1: 11 am to 9 p.m.
December 24: 11 a.m. to 7 p.m.
January 1: 12 nn - 9 p.m.
January 2: 11 a.m. - 10 p.m.
December 26 - 30: 11 a.m. to 11 p.m.
January 2-8: 11 a.m. to 10 p.m.
December 19-23: 10 a.m. to 11 p.m.
December 25: 12 nn to 9 p.m.
December 19-23 and 25-30: 11 a.m. to 10 p.m.
December 24 and 31: 11 a.m. to 9 p.m.
December 19-23: 11 a.m. to 10 p.m.
December 24 and 31: 10 a.m. to 8 p.m.
December 19-22: 11 a.m. to 11 p.m.
December 23 and 25: 10 a.m. to 10 p.m.
December 30: 10 a.m. to 11 p.m.
December 19-23: 10 a.m. to 9 p.m.
December 24-26: 10 a.m. to 10 p.m.
December 27-30: 10 a.m. to 9 p.m.
December 19-22: 10 a.m. to 10 p.m.
December 24: 10 a.m. to 11 p.m.
December 26-29: 10 a.m. to 9 p.m.
December 30: 10 a.m. to 10 p.m.
December 19-23: 10 a.m. to 10 p.m.
December 25-29: 10 a.m. to 9 p.m.
December 30: 9 a.m. to 10 p.m.
View the nationwide list of Robinsons mall schedule here. 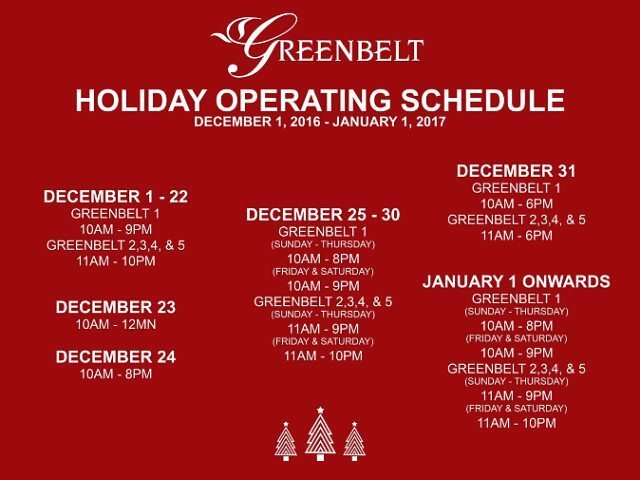 December 25: 12 nn to 8 p.m.
December 26-29: 11 a.m. to 10 p.m.
December 25-30: 11 a.m. to 11 p.m. 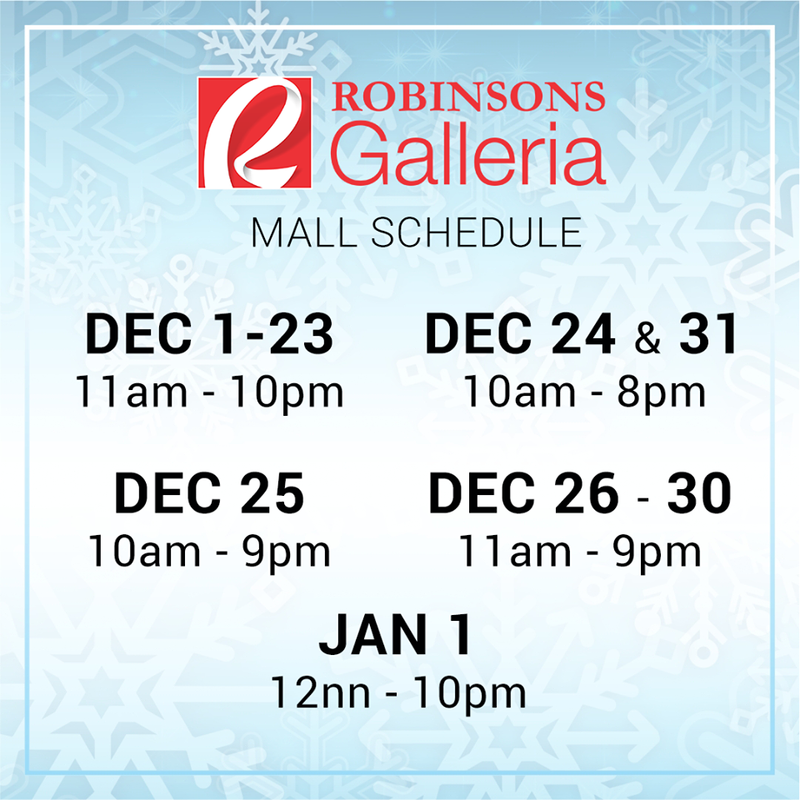 Looking for SM malls schedule? It's here. Share now this post if you find this informative. Happy holidays!